Photo of near-Earth Asteroid Itokawa taken by the Hayabusa spacecraft in 2005. Hayabusa, the first sample return mission of the Japanese Aerospace Exploration Agency (JAXA), was developed to rendezvous with and collect samples from asteroid Itokawa and return them to Earth. The mission was launched in May 9, 2003 from the Uchinoura Space Center and encountered asteroid Itokawa in November 2005. There, it made several attempts at collecting samples in touch and go maneuvers. During one of these attempts the spacecraft unexpectedly lost communication with Earth and crash-landed on the asteroid surface, damaging the spacecraft. Despite this setback, JAXA managed to return Hayabusa safely to the Earth on June 13, 2010. Although the sampling mechanism did not work, thousands of 10-100 µm particles were found in one of the sample containers, apparently introduced during the spacecraft impact into the surface of the asteroid. Many of these particles are shown to be asteroidal grains by their chemistry and mineralogy, but they are mixed with contaminant particles from the spacecraft. Thus, instead of returning several grams of sample, Hayabusa has returned less than a milligram of sample. 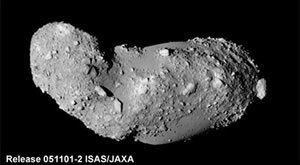 Nevertheless, these are the first direct samples of an asteroid and their geological context is well established from extensive spacecraft surveys of Itokawa by the Hayabusa spacecraft. These samples therefore have great scientific value. Initial chemical and mineralogical analysis was performed by the Hayabusa Joint Science Team, which is comprised of scientists from universities and research institutions in Japan, Australia, and the United States. See the About The Hayabusa Mission section of this site for a list of NASA researchers who participated in the Hayabusa Joint Science team. NASA will receive approximately 10% of the returned sample for its support of the mission. The first 15 Hayabusa particles were delivered Dec 2011. This material will be curated at Johnson Space Center and made available for allocation to the international scientific community beginning in early 2012. Hayabusa sample requests are now being accepted by the Curator at JSC. For request deadlines and guidelines, see the Sample Requests section of this site.